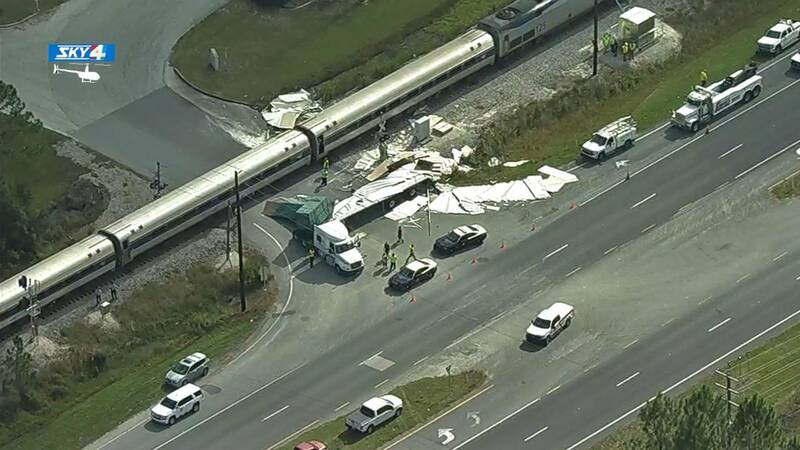 BOSTWICK, Fla. - Six passengers were injured Thursday morning when an Amtrak train hit a flatbed truck at a crossing in Bostwick, according to the Florida Highway Patrol. Troopers said the truck, which was carrying gypsum boards, had left the Seminole Power Plant and was stopped in the crossing, waiting for the light to change at the intersection with U.S. 17. The crossing arms came down on the trailer just before the train hit the truck, according to FHP. The cab was not hit, but the impact scattered the truck's load. Six people on the train suffered minor injuries and were taken to hospitals as a precaution, FHP said. There were 166 people on the train. The crossing was closed until about 3 p.m., and the truck driver will be cited, troopers said. This accident happened one-half mile from the intersection where an Amtrak train struck a garbage truck eight days ago. No one was injured in that incident.